We’d love your help. 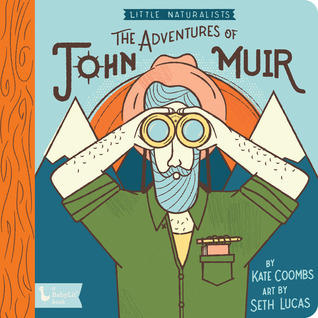 Let us know what’s wrong with this preview of The Adventures of John Muir by Kate Coombs. Introduce your baby to the fascinating adventures of famous naturalist John Muir. John Muir was a Scottish-born American naturalist, author who became known as "Father of the National Parks." Millions have read his letters, essays, and books of his adventures in nature, and his advocacy was essential in helping to preserve many beautiful parts of the West--especially Yosemi Introduce your baby to the fascinating adventures of famous naturalist John Muir. John Muir was a Scottish-born American naturalist, author who became known as "Father of the National Parks." Millions have read his letters, essays, and books of his adventures in nature, and his advocacy was essential in helping to preserve many beautiful parts of the West--especially Yosemite National Park. Kate Coombs' enchanting poem and Seth Lucas' adorable illustrations share Muir's love of the Sierras, the Sequoias and Redwoods, and the birds and animals of the West with the next generation of little nature-lovers, fostering a life-long appreciation of the world around them. To ask other readers questions about The Adventures of John Muir, please sign up. Read this at bedtime a couple of nights ago. Love the brightness and contrasts.